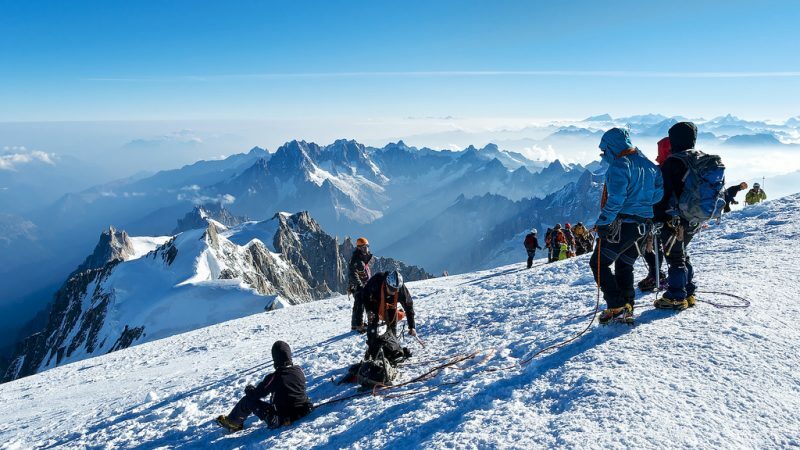 If you’d love to tackle Western Europe’s highest mountain, but you’re not sure where to start, then this extensive guide on how to climb Mont Blanc will be of use to you. Towering proudly over the French Alps, Mont Blanc is high up on the bucket list for many climbers, hikers and adventurers. Its imposing icy structure is alluring to many and pulls in thousands of climbers each year hoping to reach the impressive snowy summit. It’s here that the efforts you have poured into this challenging climb are rewarded generously with mountain landscapes of epic proportion. It’ll truly take your breath away. How tall is Mont Blanc? 4,809m. Where is it? Mont Blanc is located in the French Alps and stands in a range called the Graian Alps. The mountain’s summit actually sits within the border of Italy, so technically it’s located in both France and Italy. 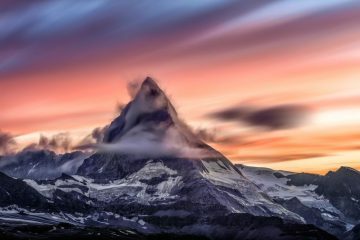 Is it the tallest mountain in Europe? Mont Blanc is sometimes incorrectly considered as the highest mountain in Europe, but Mount Elbrus (5,642m), which is stands in the Caucasus range in southern Russia. What does Mont Blanc mean? It’s French for ‘white mountain’. 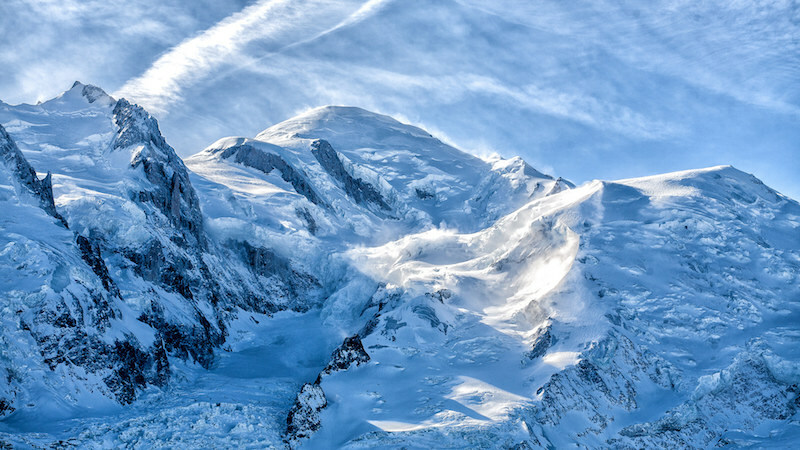 What’s the lowest recorded temperature on Mont Blanc? A chilling -43C, recorded in January 1893. How many people summit the mountain each year? Approximately 20,000 people. Can I climb Mont Blanc? Before tackling this mighty mountain, you need to be honest to yourself about your fitness level. 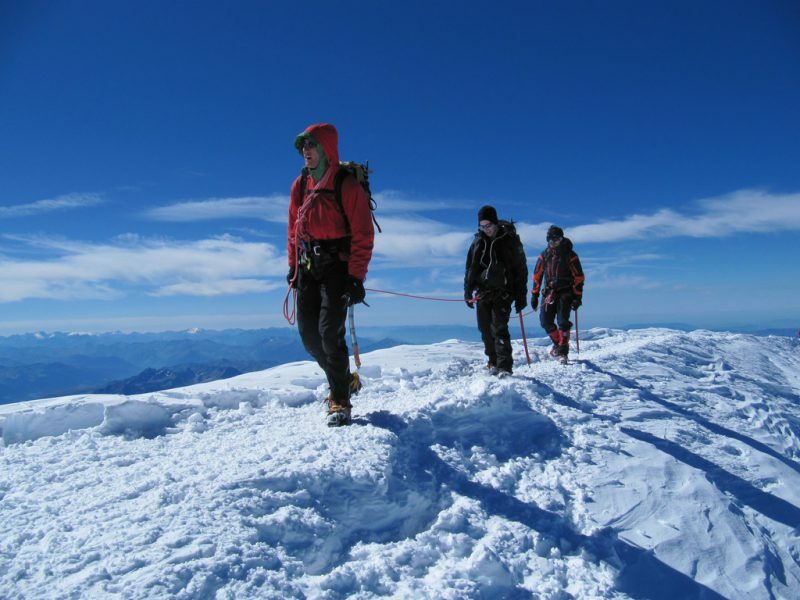 If you’re climbing with a guide, then you’ll pleased to know that most hill-walkers with good experience in trekking in snowy and winter conditions should be able to climb Mont Blanc. There are relatively non-technical routes and if you’re a competent scrambler, then you should have no issue. You’ll just need to make sure you acclimatise to altitude before you tackle it, which we’ll come onto in more detail later. 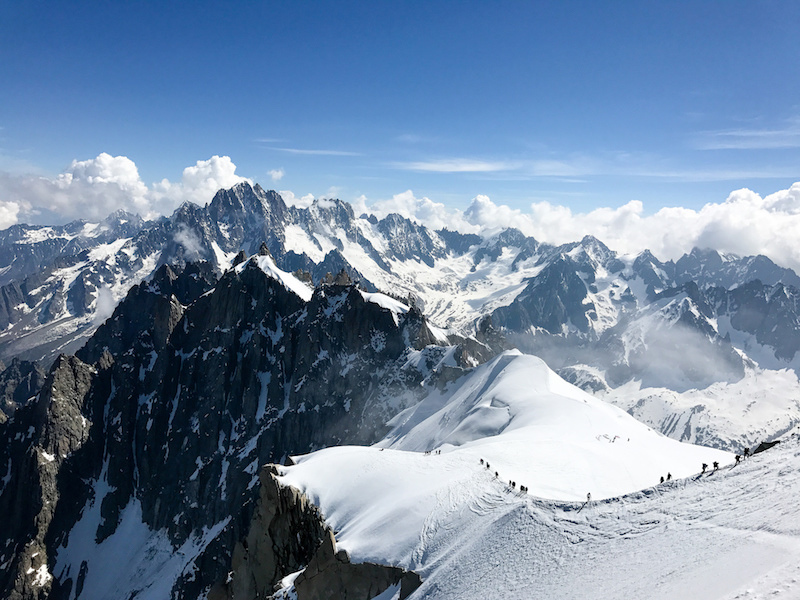 With life-threatening dangers such as rock falls, avalanches, exposure, extreme weather and crevasses, it is essential that you hire an experienced guide for your Mont Blanc climb, unless you are an experienced mountaineer. 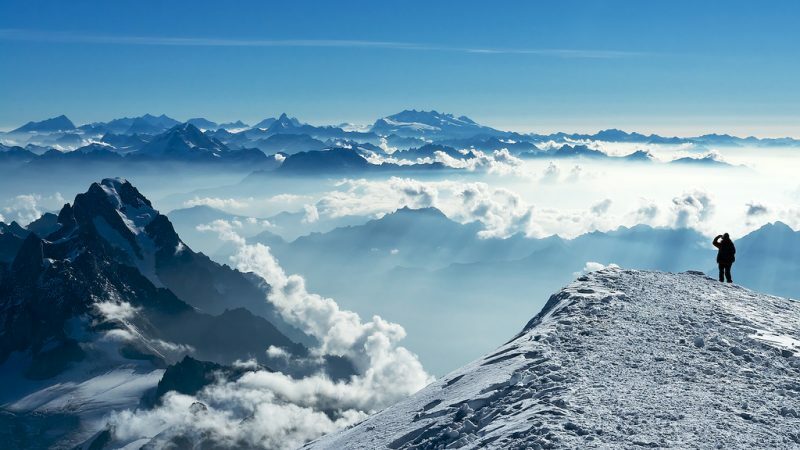 How long does it take to climb Mont Blanc? Usually, the climb is done over three days, though many guiding companies will include a couple smaller mountain ascents into the itinerary, spreading the trip out over more days. The first day sees you catching the tram to the Nid d’Aigle to 2,372m (alternatively the Bellevue cable car to 1,800m), you’ll then tackle approximately a five hour climb to the mountain refuge (this could be the Tête Rousee Hut (3,167m) or Goûter hut (3,817m), where you’ll have a hearty meal and stay the night. Early the next day, you’ll summit the last section of the mountain which is mostly of glaciated terrain including an exposed ridge, therefore, crampons and ice axes will be essential along with a harness, helmet and ropes. After reaching the summit, you will then descend back down to one of the mountain refuges. The final day is the decent back down the mountain, arriving back into the Chamonix Valley via the tram or cable car. 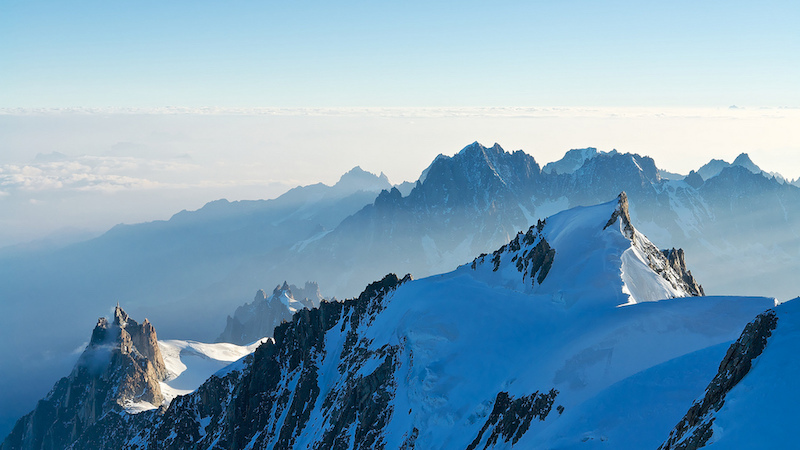 When is the best climb to climb Mont Blanc? 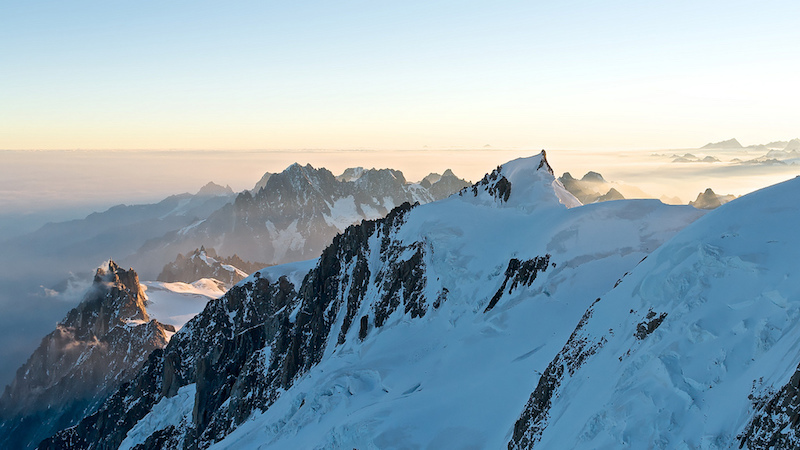 The best time to climb Mont Blanc is considered to be from around mid-June to the middle of September. This, of course, is all dependent on the weather conditions and should the weather be too bad, a climb will need to be postponed for safety reasons. 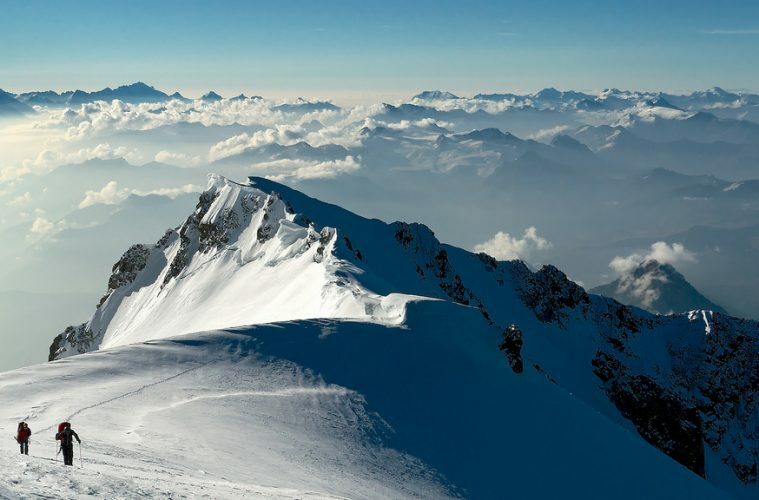 There are five main routes to the summit of Mont Blanc. To ascend via the Aiguille du Goûter is considered to be the ‘normal’ route, then there is the Aiguille du Midi traverse, the Grands Mulets is known as the historical route and then there is the Miage – Bionnassay – Mont Blanc traverse, which is the ‘normal’ route from the Italian side of the mountain. 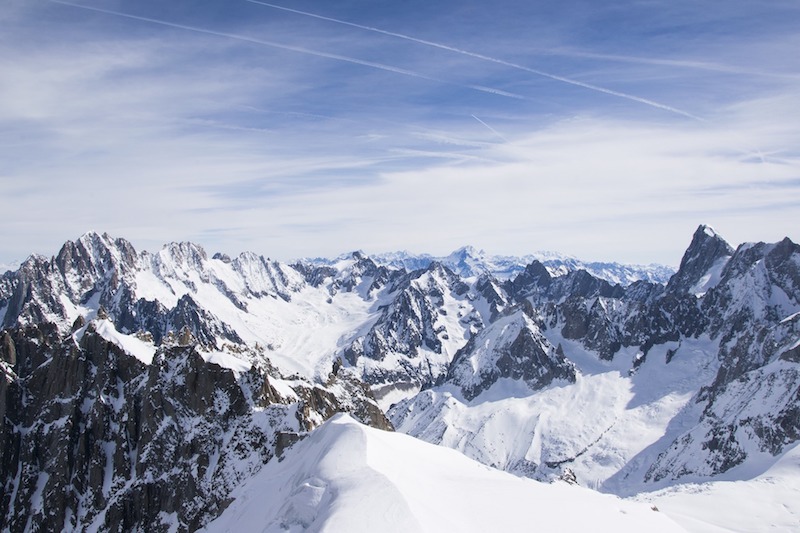 The Aiguille du Goûter route is the easiest, though some climbing equipment such as crampons and ice axes will be necessary, it’s not a technical climb. So as long as you have good experience with using this equipment, you should be at a level that will enable you to climb this route. There’s no point kidding yourself, you’ll need to have a good level of fitness in order to tackle this snowy beast and you’ll need to start preparing for your climb at least six months in advance. Long, challenging walks in the mountains are ideal, along with long-distance runs such as half marathons. You need to remember that, not only will you need to deal with endurance, but your body will be dealing with altitude on the mountain too. Many people can develop altitude sickness at great heights, which can be very dangerous if left untreated. Therefore, it’s much safer to properly acclimatise before you set off. What level you can push yourself at sea level will be totally different to that of at altitude. Will I need to acclimatise? 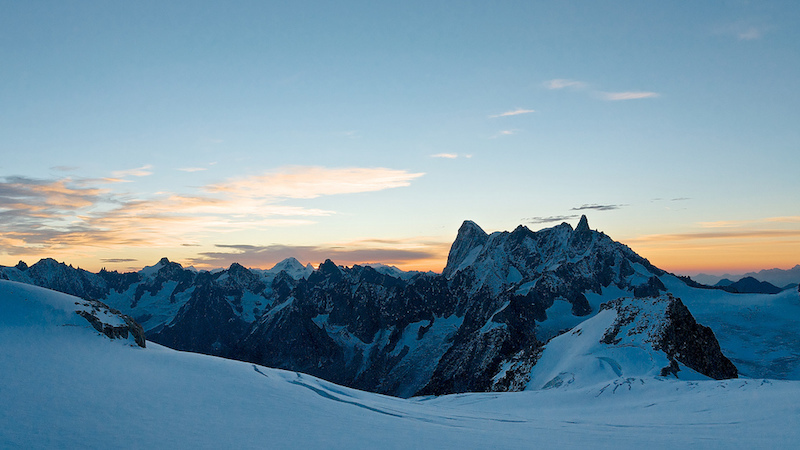 It’s recommended that you take on peaks of increasing size before you tackle Mont Blanc. So, try to take on summits in the region of 2,000m, then 3,000m and if you can, 3,500m or 4,000m before you tackle this mammoth mountain. Mountains to consider would be Kronplatz (2,275m), Plose (2,562m), Latemar (2,799m), Marmolada (3,343m), Grande Casse (3,855m), Gran Paradiso (4,061m), Barre des Ecrins (4,102m) and Monte Rosa (4,634), all of which are located in the French and Italian Alps. It’s essential for your safety that you have the right gear for your Mont Blanc climb. Depending on when you climb and the weather conditions (which can be unpredictable in the mountains), you could be facing anything from warm temperatures to those well below zero, so you need to be prepared. How do I book my Mont Blanc climb? It’s best to book as far in advance as possible to avoid disappointment, as guiding companies and mountain refuges can get booked up very quickly. 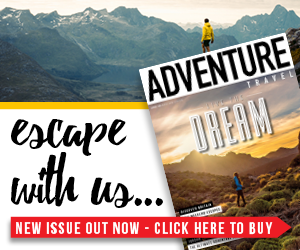 There are many, many companies who offer guided climbs to the summit of Mont Blanc but companies such as KE Adventure, Exodus Travels, Jagged Globe and Mountain Kingdoms. Prices can vary depending on whether or not your flights, equipment, food and accommodation are included, so always check the full details before booking.